Publishing mission - to make the results of scientific researches of Russian scientists available for foreign academics. 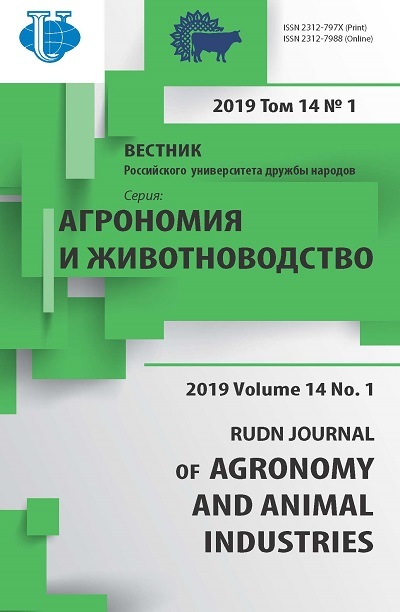 Russian Journal of Agronomy And Animal Industries — a period international reviewed scientific publication in the field of agronomy. The journal is international both in terms of the editorial structure and expert board and authors and subjects of publications. The journal is intended to publish results of the fundamental and applied scientific researches of the Russian and foreign scientists in the form of scientific articles, review scientific material, bibliographical reviews on specific topics of scientific researches. The journal may publish the materials with the scientific value and suitability for publication valued by the journal editorial board. The editorial board of the journal invites for cooperation the professionals engaged in such spheres as agronomy, animal industries, veterinary - sanitary expertise,veterinary, veterinary-sanitary expertise, land use planning and cadaster, landscape architect to prepare special thematic issues. Creative Commons Attribution International 4.0 CC-BY. If the work involves chemicals, procedures or equipment that have any unusual hazards inherent in their use, the author must clearly identify these in the manuscript. If the work involves the use of animal or human subjects, the author should ensure that the manuscript contains a statement that all procedures were performed in compliance with relevant laws and institutional guidelines and that the appropriate institutional committee(s) have approved them. Authors should include a statement in the manuscript that informed consent was obtained for experimentation with human subjects. The privacy rights of human subjects must always be observed. When reporting experiments on animals, authors should be asked to indicate whether the institutional and national guide for the care and use of laboratory animals was followed. You can see the List of retraction articles of this journal.